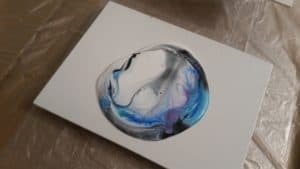 It’s time—you’ve watched a ton of videos, read all the blog posts, and drooled over the gorgeous pictures of acrylic poured paintings. So why haven’t you done your first poured painting yet? Maybe you’re worried about what it will look like, the costs, or what someone else may think? First off, just breathe. I’ll walk you through your first pour with a few helpful tips. First tip; don’t expect amazing results in the beginning. Mind you, it may be that your first pour is absolutely gorgeous, but don’t be crushed if it’s not what you expected. This is the time to practice, learn how to mix your paints, which brands you like, color combinations you prefer, etc. Whoever first said “go big or go home” wasn’t creating their first poured painting. This is practice, so pick up a few inexpensive canvas panels, keep the sizes small (4×6, 5×7, etc). 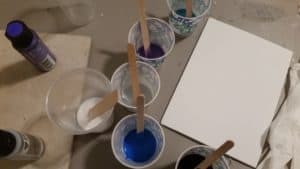 This way you won’t waste paint, you’ll have multiple canvases to work with, and you won’t worry about trying to cover the sides of a stretched canvas. Remember, this is just practice. You will want a good white such as Artist Loft Titanium White, but for all other colors you can go with the inexpensive brands like FolkArt, Sargent, DecoArt, Craft Smart, or Basics by Liquitex. Do you need a torch? My personal opinion is no, not if you have good eyesight; and absolutely yes if your vision is poor. The torch is to remove bubbles under the paint, and you can’t remove them if you can’t see them. You can use a toothpick, paperclip, pin, skewer, or anything else with a tiny tip you may have on hand to pop bubbles—again, only if you can see them. 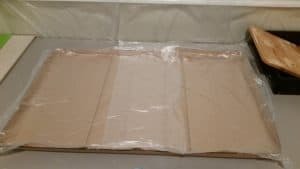 Start with inexpensive canvas panels, which are simply canvas over cardboard. Canvases stretched over a wood frame can be pricey and may even seem intimidating when first starting out. You don’t need a turntable, specialty stirs or forms, silicone or even a specific room for your painting. You can get by with disposable gloves, paper cups, popsicle sticks and either a torch or sharp object to pop bubbles. Forget the silicone for now. If you layer your paints with the Titanium White, you will normally obtain cells. Lay your painting on top of paper cups. They are perfect for manipulating the canvas and of course to allow your painting to dry. Be careful not to scrape the sides and bottom too much or you may end up with wax in your painting. Garbage bags can open up any space to painting. Cover the area to keep the paint from damaging the surface underneath. If working in an area with carpet, use a heavy paint tarp as well to protect from splatter or accidental runoff. I also use garbage bags to protect my walls. Let’s get busy and complete your first pour. For our sample painting, I used a 5×7 canvas panel. You’ll only need two ounces of paint in your final pour cup, no matter what colors you choose. Dixie bathroom cups are three ounces, so this can give you a good sense of the cup size you need to work on something this small. Once you get more comfortable with mixing and pouring, you’ll be able to decrease this amount of paint. There is no silicone in this painting, but as you layer the Titanium White, you should still obtain cells! Start by mixing your paints. Use one cup per paint color and then mix one part paint to two parts Floetrol Flood medium for each paint color. Mix each well and add a drop or two of water to thin to the consistency of warmed honey. Right before my first pour, I went to the kitchen and warmed up some honey to know what it looked like, and especially what it felt like to stir it with a popsicle stick. A huge help! Layer your paints in a three ounce cup, starting with Titanium White. Next, add each color, with white between every layer. 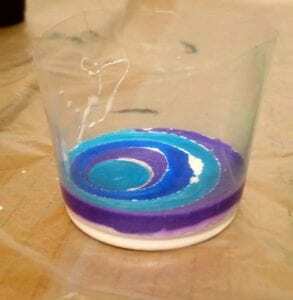 Pour about 1/3 of each color per layer, creating multiple levels until you have about two ounces of layered paint in your pour cup. You will likely have paint left over, just set it aside to use for another painting. Warning! Be sure to always use a pour cup size close to the amount of paint you’ll be pouring. If your pour cup is too large, your paints all mix together as they run out of the cup, creating a muddy look with little to no cells. For a clean pour cup mix, use the smallest cup possible. Here I used the exact same paint colors, layers, and amounts; all I did was use a much larger pour cup (eight ounces) to show you the difference in cup sizes. 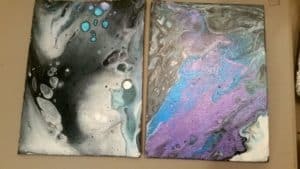 This side by side shows the difference between a muddy pour (pour cup too large) and a clean pour (pour cup just big enough to hold the layered paint). Due to canvas size, I only added a small puddle of white paint in the middle of my work canvas. 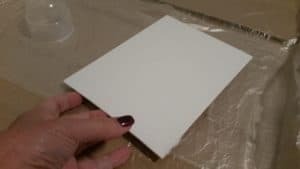 If using a larger canvas panel or a stretched canvas over a wooden frame, you’ll want to cover the entire canvas with your white paint prior to pouring. The coated canvas allows the paint to slide across the canvas and fully cover the sides. Now for the real fun, preparing your Flip Cup. 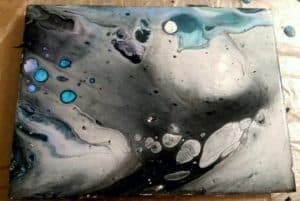 The easiest way to do this is to lay your canvas upside down on top of your flip cup and then invert both, holding them together as you set the canvas down. 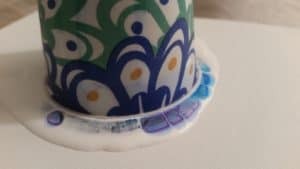 Leave the cup upside down for at least 60 seconds. This starts the formation of cells. Next, gently and slowly remove the cup. Again, leave the paint alone for at least 60 seconds. If you are using a torch, you can pass the torch over, one very quick pass to pop bubbles. Not necessarily needed, but again, it helps with cells and bubbles. Next, take your time and gently start tilting the canvas, allowing the paint to flow. You can use one of two tilting methods, both work well. Tilt your canvas to one corner or side, then back to the middle; tilt to the opposite side, and then back to middle, repeat to each side or corner until the canvas is covered. Basically, you want to keep the mass of paint in the middle of the canvas, slowly stretching it out to the sides and corners. Keeping the mass of paint in the center of the canvas, slowly tilt the canvas in a clockwise motion, spreading the paint across the canvas. Once it has spread across the entire canvas, it’s okay to let additional paint run off the canvas as needed. Try to keep your cells on the canvas, while allowing the portions you may not be happy with to run off. Step back and look at the canvas from a different angle, if needed, to determine which side or corner to allow any extra paint to run off. If you’re using a torch quickly do one rapid pass, or take the time to use your toothpick and gently pop the bubbles. Here’s the hardest part, don’t do anything more, walk away, let the magic happen as it dries. Be sure to leave comments below if you have additional helpful hints you learned from your first pour. How do I mix my paints with resin? Will I still need to add the Floetrol first? Hi Ingrid, I’ve only done a couple of projects with resin, so I’m definitely not the one to provide advice about resin. I wouldnt even know what to ask a professional for you. If I were you I’d ask this on the main acrylicpouring.com blog. I have only used resin as a finisher. From what I’ve seen, on video only, using resin is a completely different process depending on what you are wanting to do with it. Really wish I could be more help, but the best advice I can give is to refer you back to the blog. Very clear and well organized info. VERY good article. When you put the white on the canvas prior to pouring,is the white paint mixed with Flotrol and water? Thank you. Thank you for this great step by step tutorial. Could you give the amount of paint for 1. an 8×10 canvas. 2. 9×12 canvas. How do you calculate the amounts for different size canvas? Thank you very much. It’s been very confusing watching all the videos and wanting to get started. You have cut to the chase in a simple and informative way. Well done! Hi Diane, you may have a bad link, as I do not offer any courses, I think my email may be linked to one of the videos. Sorry I can’t answer your question, but I’ll let the moderator know and maybe they can give me the correct link for you. For a 8×10 use 3 oz, and 9×12, 4 oz. This seems to be pretty close to what I’ve found works with most projects. I typically have about an ounce extra of what ever base color I’m using just in case I need extra for the sides. For larger canvases, just google “amount of poured paint per canvas size” and click on images. There are many charts out there and most show the same amounts. As your canvases get larger, you need to add in more for the sides, so it’s a little different and the charts show you how to calculate for them. Hope this helps. Very nicely done. I appreciate your advice about using a small cup for my pours. I’ve been using a cup that is much too large and haven’t been thrilled with the results so I’m looking forward to trying the smaller cup. One question, you mentioned covering the canvas with white paint. Is this mixed with Floetrol or is it just plain paint? Using the same size cup as you are using for total paint will make a world of difference. Yes, it’s part of the white with Floetrol mix. Good luck! Yes,definitely helpful to mention not to use a cup that is too big. I’m sure that’s why some of mine have turned out ‘muddy’. Great tip! Thank you for this great lesson on pouring. Very well written! Thank you! I just read your tutorial. The pour I did turned out great!!!!! The best yet. I didn’t have a torch but used a blow dryer on low and it worked beautifully. Wonderful! You can use a blow dryer, and using it on low was perfect. You just need to be patient and don’t get too anxious as you can move your paint around in the process. Long distance Hi five! Thank you so much – very helpful. I have only recently started to explore this medium and I am wondering what difference does silicon make and do you put it in all the colours or only in the white? Hi Margaret, the silicone helps create the cells. There’s no need to put it in every color. I use 1/4 silicone, simply meaning I add it to 1/4 of my paints per painting. In the sample I did for the article, I didn’t want folks to feel they had to use silicone to create cells. I use treadmill oil, just 2 drops per selected paints. Also, you don’t need silicone in the white paint, especially if you use Titanium White as it has enough weight to sink to the bottom automatically creating cells. 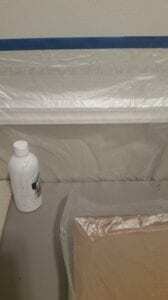 Can dish soap or elmers glue be used instead of floetrol? And how much do u mix in with paint. 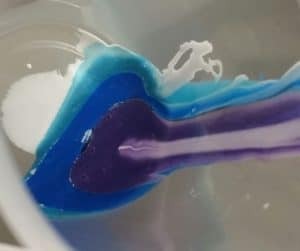 You may have heard of people using dish soap for cells, my suggestion is to stay from dish soap, it can cause your paint to bubble and peel off the canvas. Instead I suggest using Essential Values Treadmill Lubricant, which you can get from Walmart for 11.99 for a 3 pack. It only takes a couple of drops in 1-2 colors to create beautiful cells. Yes, you can use “Elmers Glue All” but not regular Elmers school glue. It’s a little thicker than Floetrol so you’ll want to play with it and see which works best for you. The step by step is helpful, along with the tips I’ve missed watching tutorials. Getting ready to do our first large pour for my daughter’s dorm room. The white paint that goes on first… do you let it dry before the pour or apply and then do the pour? 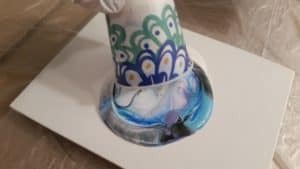 Your pouring white over the canvas, spreading it across the entire top and sides, then while still wet, go ahead with your cup pour. The base white acts as a lubricant for the pour to slide over the canvas and keeps the colors more vibrant. 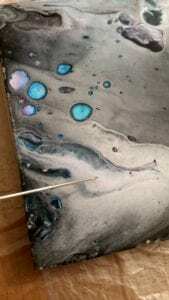 thanks for the step by step procedure,I will try it for my first step.I make some post card and this is my first step for pouring.PLEASE visit my face book ( noeljoachim to see my post card and invite for your advice. Hi, I’ve never worked with postcards, but I’m sure you’ll need to use much less paint. I’d try 1/2 ounce total paint first, then adjust it accordingly. What a concise and simple explanation of the pour technique. A friend told me about pouring and sent a video to show what it was all about. I was intrigued and looked for how to videos, beginner videos, list of products needed, etc. and after many frustrating hours wasted trying to just get the basics I found you!!! I have probably made my hunt too complicated as I usually work in oils or collage and supplies can be very technical but even so I think you deserve a YouTube Emmy for keeping it simple!! Thanks so much, I’m off to create!! Thank you about the part on cup size, did not get that information in the videos for beginners I’ve seen and I’ve seen to many to count. Great tutorial for beginners! I’ve been kinda trying this in my spare time, but not with great results. Definitely going to try this method for pouring! Thank you. I’ve tried to do this from advice from co-workers,,,didn’t quite get it. This I can do with your instructions. Thank you!!! Thank you Gloria! Don’t give up, I had to try so many before I got my first success. It’s so worth it, and that first “giddy feeling” is pretty awesome! Good Morning Latifa, thank you! If you are seeing lumps-bumps in your dried painting, there are a couple of reasons this can happen. 1. Make sure you clean the tops of your paint bottles each time after you use them, as dried paint around the opening may pour into your mix cup. 2. Be sure to thoroughly mix each paint-floetrol cup to help break down any lumps from paint OR floetrol. 3. Lastly, if you are still seeing bumps, you can try a paint strainer which will get rid of almost everything. They can be found at most home improvement stores or on amazon. First of all thank you for your tips and your tutorial – very well done! How long would you assume a pour will dry on a canvas (about a 6 x 6) before it can be moved or transported in a car? Thanks in advance! Hi Sylvia, actually I don’t move mine till 24 hours. If super careful maybe 12, the real risk is the unknown pieces (animal fur, dust, etc) floating around that can land on you half dried painting and ruin it. A 6×6 inch should dry quicker too, so as long as it’s protected so it won’t bounce around, maybe in a flat bottom tuperware dish with a lid, then 12 hours is probably good. * do you use gesso on your canvases? * Regarding the titanium white paint…. Do you pour this paint in the middle of your canvas then cover even on a larger canvas? I’ve looked for gallon sized of titanium white … just curious what you use on larger. Hi Cindy, first off thank you. The Artist’s Loft Canvas I typically use, they are already guessoed, so no need to mess with that. I only use guesso if I’m painting on something slick, metal or raw wood. Oh my goodness! Thank you so much! I have been using Apple Barrel white AND leaving too much paint on the canvas! No wonder I have tiny cells and cracks everywhere. Can’t thank you enough. Hi Tina! Love your tutorials btw…question…on all of my pours i notice the paint won’t stick to the outside edges where the paint runs off. I do put down white and make sure I coat those edges but i can still see canvas. Am getting my paint mixture too thin or is it too much silicone? Help!! Hi Lori, I think I understand what your saying about the edges, there are some of the cheaper canvases that may do this. Here are a couple suggestions if you find its happening on more than one of the same brand of canvases. 1. You can paint the entire canvas with your base color, let it dry, then lay a new base layer and go from there. Just be sure the initial layer dries completely before you start the process. 2. You can also just paint those edges with a paint brush making sure it’s nice and smooth. I would use a slightly thicker mixture on the edges, but then go ahead with the normal process. You don’t need to wait for it to dry before you lay down your base coat. I think you’ll be fine if you do one of the suggestions above. Hi Maria, Great question! I typically use a piece of plastic taped to the back side of the canvas with painters tape. After I’ve completed my pour, I use an artist’s spatula, but you can use a clean stir stick to scrap off any drips “while they are still wet”. Then I take a lightly dampened paper towel and wipe off the remaining paint being extremely careful not to touch the sides of the canvas. Lastly I carefully remove the tape and plastic before I walk away to let it dry. If it dries you may damage your painting trying to remove the tape. I hope this helps. 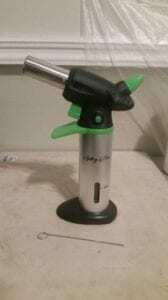 Hi ,I’m Rita….love your tutoring videos…..question…what can I use instead of floetrol…..I’m learning how to use different methods wen I pain…..
Hi Rita, I’ve tried other products, but alway seem to come back to Floetrol. Other artists like Elmers Glue All, XIM, Zinsser, and M-1 latex extenders from the home improvement stores. I think most work fine, it’s all about preferences and finding that perfect mixture of medium to paint. What I did was purchase one at a time, then tried varied amounts of paint to medium till I obtained the consistency I wanted. Each one seems to be a little different, some thinner, some thicker. Work with inexpensive paints till you get the consistency you want. I’m pretty sure all of the are available through Amazon, some through Lowes, Home Depot and Walmart. Hope this helps. Hi Tina, I was so happy to come across your step by step instructions! My friends and I are going to attempt our first paint pour at our next craft night and I am so excited! We will be using 8×10 canvases since I already have them on hand. I just wanted to know if there is anything we should use as a sealant once they are dry or if it is better without. Thank you! Hi Devonna, that sounds like so much fun! You’ll need to let them dry for several days, I typically wait a week. Then you’ll take a clean rag, place it in a bowl of soapy water, squeeze it out and wipe off the canvas. This will clean off the silicone. Then use a clean wet rag (water only) and rinse off soap by allowing clean water to gently run over painting. Let dry overnight. Lastly, seal it with your favorite polyurethane gloss varnish or spray. Hi there Teena, the answer to your question is yes. I have pour painted on furniture, but never a piece that large myself. As long as you go about it strategically and plan out each phase, I think it could be amazing. Yes absolutely practice first, and as you get things fine tuned start going bigger. You don’t want to go from an 8×10 canvas to a chest of drawers, instead move to a larger canvas, and maybe even try to pour paint on a smaller piece of furniture first. I’d probably find a second hand nightstand or end table to practice with. Once you start to proceed on the chest, be patient with yourself. If you intend to cover the entire piece, go slowly and only pour on one flat surface at a time, except for the drawers of course. Allow each side to dry for at least a couple of days before you turn it to the next side. If it’s bare wood, be sure to seal the wood first, I usually lightly sand, then apply a light coating of an all purpose spray paint..very light coating. Don’t completely spray paint everything, keep it light, just mist over it. This seals the wood so it won’t soak up your paint, and allows the paint to flow better over the wood. Lastly don’t forget to clean off silicone by thoroughly washing the piece before you give it a final varnish. Great and easy tutorial. Question: how long goes an 8×10 usually take to dry? If your in a dry warmer climate, at least 16-24 hours. I’m in Washington state so because we are in our rainy season, I give mine 2-3 full days to dry. This is exactly how I need this explained to me. Omg, this is great. A fountain of knowledge. Seriously, thank you. You are so welcome, thank you and good luck! Your super-clear directions are so appreciated by all of us, but what I find most awesome is your generosity of spirit! It positively shines through in every suggestion and response you make. Go ahead and polish up your halo. Deb, thank you for your kind words of encouragement. Every one of the bloggers love sharing our experiences with fellow artists. Each question gives us more joy than I can explain, we thrive on teaching and inspiring others. Let your joy flow Deb, pour away! Can you seal the painting as in the tutorial with resin? Laura, yes you can seal with resin. Just be sure to thoroughly clean your dried painting first, as resin will bubble or (not seal) if there is any silicone left on the surface. Man… I swear I’ve read and/or watched every single tutorial but could never get mine mixture to flow right. But this helped me sooooo much. The white paint all over the canvas first makes so much sense and I always had either way to much paint after the flip or not even close to being enough and all of my attempts (about 10) have turned to a muddy waste. I’m going to try again exactly like this suggests… Wish me luck. And again thank you so much for taking the time to write this you have no idea how much this had helped me!! If you get bored one day you can look at some of my abstract work prior to pouring.. Very impressive with the way you organized and and with all the advices you gave. I am a beginner on this, and I live in the Philippines, which means I am limited to finding some of the materials. And I am contemplating buying Floetrol and Resin online. However, I would like to know, is it really necessary to have Floetrol at all times in mixing? Thank you and looking forward to learning more from you.